The London School of Economics and Political Science (LSE) is one of the main International Universities to embrace a wide range of topics under the Social Sciences umbrella, from Economics to Law and Sociology. 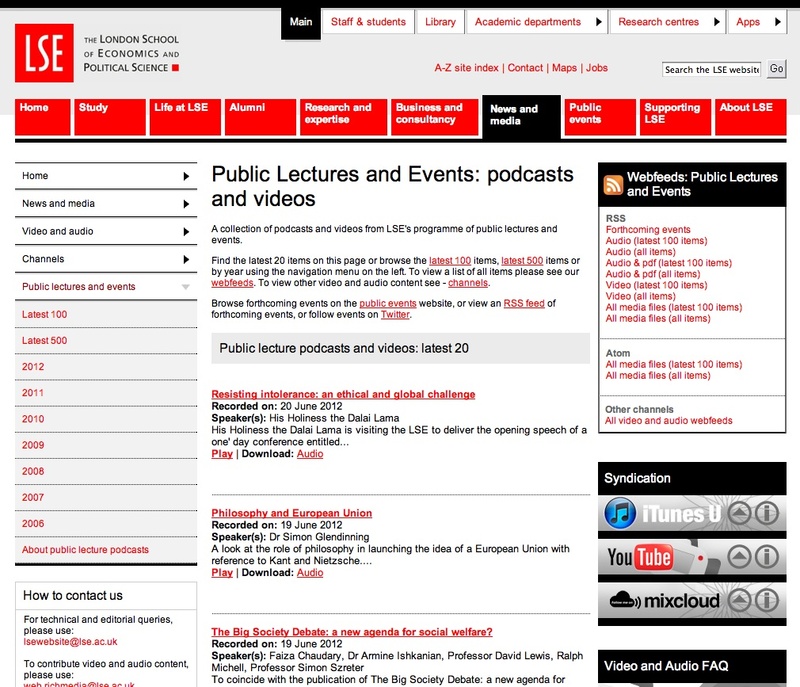 A selection of some of the best lectures and events held at the school are recorded and uploaded onto the website and visitors can access them on the “Videos of public lectures and events” page. Users can keep up-to-speed with the latest releases by following the official Twitter and Facebook page of the Department, or by simply scanning the podcast section where videos are organized chronologically. An RSS feed tool is also available. The videos are embedded in the page and the player hosts a long list of contents accessible by scrolling down the bar on the right. Details about the speakers are also provided. Topics range from gender to finance to geo-politics and the environment. The platform is entirely open, therefore all users can visit the page without signing up or providing personal details.